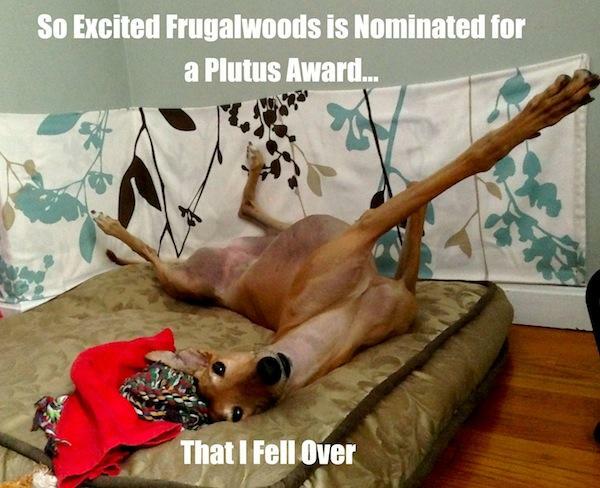 Earlier this week I learned an amazing thing: Frugalwoods is a finalist for a Plutus Award! If you just asked the question “what the heck is a Plutus Award” well then my friends, you are in luck! Here is a fact you can learn today: Plutus Awards “recognize the best of the personal finance blogosphere” and are awarded annually to the top personal finance blogs at a thing called FinCon. You will be astounded to learn that FinCon is NOT, in fact, a convention for pickpocketing dolphins, which was naturally my first assumption. It’s actually “a peer conference for the financial media community” (2nd fact of the day). So, pretty much a bunch of people like me (though probs not as weird) congregating, sipping scotch, and discussing the interior leather color on their 50′ yachts (which I still don’t own, don’t care to, and never will, btw). We are blown away and deeply honored to be finalists! The only problem? 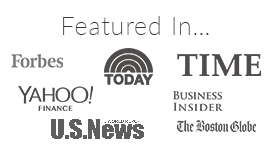 We were nominated for Most Humorous Personal Finance Blog. Folks, I don’t know what gave you the impression that this is a humorous blog. This is a financially astute, rigorously analyzed, altogether serious blog. Frugalwoods would never write such tawdry frugal comedy as Great Trash Finds, Breakfast: The Hidden Destroyer, Travel Cheap by Being a Thanksgiving Weirdo, or the venerated Frugal Hound Sniffs column. We aim to deliver our content in the driest, most straightforward manner possible. I’d never make you wade through a million photos I’d taken of my clothes spread out on my floor in order to learn why I’m banned from thrift stores for the remainder of 2014. And I’d certainly never launch a series entirely dedicated to interviewing other people’s pets, written by my dog. Who DOES that?! This photo has nothing to do with this post, but look at how loooong she is! But in all honesty, I am taking a break from spamming the world with greyhound photos posting really useful and intelligent content to say THANK YOU. Really and truly, Mr. Frugalwoods and I are nothing less than bowled over to be finalists. We are honored, thrilled, shocked (again, people are actually reading this thing?! ), and just downright giddy as a greyhound in a bathtub of squirrels. 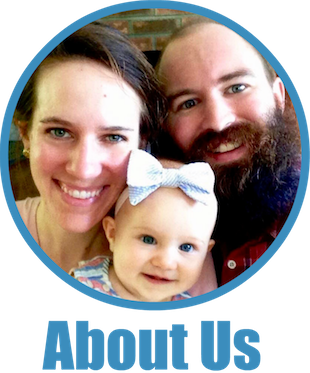 We are grateful to everyone who voted for us, supported, and encouraged us along this little blog journey. And, to frost our frugal cake, on the same day that the Plutus Award finalists were announced, my Behind The Scenes of a Happy Frugal Marriage (hint: ours!) was featured on the venerable Rockstar Finance! With a photo of us sans heads! I felt like I’d eaten an entire bag of candy corn, which, let’s be honest here, I have done, so I speak from a position of authority. Alas, the only grumble I can muster this week amidst such unfettered glee is the sad fact that the Frugalwoods fam will not be attending FinCon this year. I’m sure it’ll be fin-tastic, filled with dolphins trying to con people out of their wallets all my new internet-y friends. I’d get to do ridiculous things in person with you (as opposed to just on here and through my woefully inept usage of twitter and Pinterest). Sorry not sorry* to all of my followers about the deluge of Frugal Hound photos… and the fact that I consistently don’t use the # symbol correctly. *I was informed by my hip, 17-yr-old sister-in-law (who I love very much), that “sorry not sorry” is like a thing the kids say. And now, in honor of our esteemed nomination, what is your favorite pun? I’ll go first: What if soy milk is just milk introducing itself in Spanish? Congrats on the nomination!! That’s amazing. And so well deserved. Favorite pun, in honor of the Frugal Hound Sniffs series: My dog has a lot of potential. You just have to unleash it. I know, I know. That was pawful. Congrats on your nomination!! You absolutely deserve it! My favorite pun is both a pun and applies to my real life “I used to be a banker, but then I lost interest.” Have a great weekend!! Hah! That’s perfect, Shannon! Love it. Thank you so much–congrats to you too! Congrats again on being a finalist for your dull, overly technical, and deeply serious blog. It’s too bad you don’t bring levity, though. And I had no idea you had a Greyhound. Good thing you don’t write about her much – that would detract from the serious issues here! Dress Frugal Hound up as an aide dog? Stationary! BAHAHAH! Yeah, I wasn’t sure if anyone knew we had a dog, so I figured I should try and take a photo of her or something. Thought about aide dog, but she’d FAIL as she bumps into walls & sundry items all the time (poor thing, we think she has bad vision, but she refuses to wear her glasses). And, congrats to you too my friend! Congrats on being a finalist. And of course I now that fincon is not about dolphins!!! It’s about sharks! Geez! And yeah I’m so surprised you were nominated for being funny as this is the most straightforward and boring personal finance blog out there! :)))) yes I’m totally kidding (in case your eyes glazed over the smily faces and you thought, “I can’t believe that b___ just said that!” Seriously (get it? ), it’s great when people can take a subject like personal finance and make it so fun and user friendly! Great job! Thank you so much! We are just so excited :)! Congrats on your nomination! I’ll go in cahoots with you to get Frugal Hound to FinCon next year! I’m so glad you got nominated, but I’m really bummed you won’t be there. But hey – I got nominated last year and won when I couldn’t be there, so maybe it’s good luck!!! Hey! I will definitely take that as a sign of luck! Thank you so much for the congrats–right back at ya!! Congrats again on the nomination! I can only pull off puns in the moment, so I don’t have any favorites off-hand. I think you should just bring Frugal Hound, and let her work her magic. Who can say no to her?! Thank you so much! I totally understand–situational puns are the best. Awww, I certainly can’t say no to her! In honour of bad puns, I’ll go science-y. “I had to make all these bad puns because all the good chemistry jokes argon”. Ugh, I’m so lame. 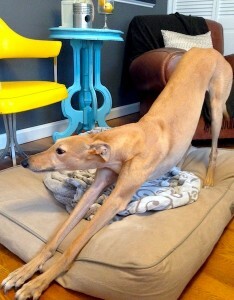 As for getting Frugal Hound into FinCon next year. Just walk in the front door – she’s a blogger too ya know. She interviews all the PF animals and is a staple of FW. Plus, everyone would automatically know who you were because she’d basically be your mascot. Why thank you! Yes, this is a very serious blog so I felt a serious response was warranted. 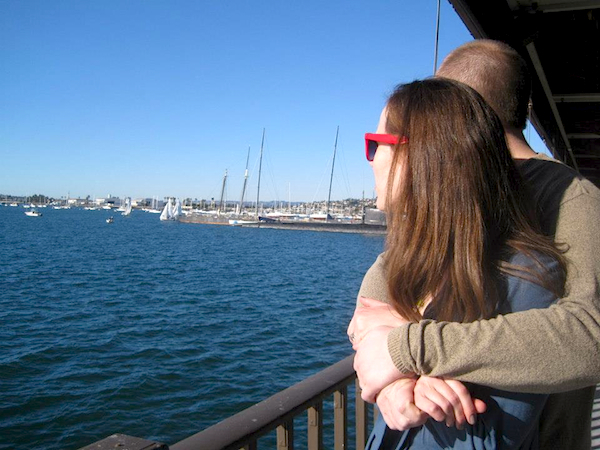 You’re so right–I wonder if people would even know who I was without her by my side?! I’ll have to make a t-shirt of her face or something tacky. Maybe airbrushed on? Congratulations! So excited to see you were a finalist. Thank you so much for the congrats–I really appreciate it! Thanks so much, Kipp! BEE DAY, hah! Thank you so much, Nicola :). Hope you have a great weekend too! Congrats on the nomination! Always enjoyed reading your blog and I’m not surprised to see you as one of the finalists. Thank you so much, I appreciate it :)! Congratulations to the whole Frugalwoods Family, including Frugal Hound! I really enjoy your humorous approach to personal finance. Also you have a great mascot in Frugal Hound who seems more than willing to pose in whatever position it takes to get the point across! Here’s keeping the fingers crossed you’re a winner. I don’t have a pun but I do have a Chuck Norris meme (which my boys tell me on an almost daily basis)–While doing CPR, Chuck Norris brought the dummy back to life. Ooooh, I was just at a yard sale and saw a suitcase big enough for a 60 pound greyhound, but I doubt it’s soundproof. I think it was $3, so let me know if you want me to go snag it for you. Congrats on your nomination. I know, right?! We should be in the “extremely important facts blog” category. Thank you so much for all the good wishes, Kassandra :)! Congrats on the nomination! Proud to be a fellow finalist! Hah! That’s pretty good! Thank you and congrats to you too :)!! Congrats and well deserved! I always enjoy reading your posts and perspective on things. Sorry, I can’t think of any puns. I know, I’ll have to ignore all their happy posts and updates too ;)! Maybe next year we’ll both go and can meet up! Ahhh congrats!!! That’s so exciting? I’m not going either, but I heard something about a virtual party for the non- attendees that I plan on crashing? Shoot. ! Not ? Sorry for making that weird. Not weird at all :)! We were tweeting about having some sort of virtual party for us at-home folks. We should definitely do something :)!! Thanks for the congrats! What do you call a cat paying a toll for a trip to Mars? A catastrophe. And a huge congratulations on being a finalist! You make those miscreant dolphins proud! That’s a good one! Love cat jokes (as does Frugal Hound). Thank you so much! Hope those crafty dolphins are kept in check! Congrats on the nomination! Awesome! And totally deserved, of course! No puns on my part though. My best puns are in Dutch only, dammit. Sad day to be a Belgian. Thank you so much! If only I knew Dutch :)! SO excited that you got nominated, FW family. 🙂 We are not going to FINCON either this year, so we’ll sit at home and wish we were there, hanging out with you guys and all the other totally fun, totally weird PF people, LOL. Thank you so much, I appreciate it! And, many congrats to you on your TWO nominations too!! I’m excited I got to use all forms of “to” in that sentence. Seriously though, well deserved! Congrats on the Plutus nomination. That is some big doins. We will also be missing Fincon this year, sadly. I am starting a new job and won’t have any PTO. I did go the last two years and had a blast, however, so you should try to make it in 2015. Thank you so much! I’m sorry you can’t go either, but, hopefully we’ll see you there in 2015! Wow, you are nominated for the Plutus award. You deserve it because we your readers enjoy every post you have on frugalwoods. Goodluck! Thank you so much, I appreciate it! I’m sad we can’t make it :(. And, huge congrats to you on your nomination! I have only recently found your site but can see that you are very worthy of this nomination. A great accomplishment. Thank you so much! Appreciate you stopping by! I’m slowly creeping over to the Frugalwoods side and one of the only dogs that makes my Husky look slow at the dog park, but her leaping ability and me yelling out my dog’s got hops is still in tact. Congrats on the award and being funny. Frugalwoods you so deserve to win! I laugh so much when I’m hear that I have to keep all liquid beverages away from my lips. Since I’m an accountant, I want to ask you how does an accountant stay out of debt? She learns to act her wage. Clearly I’m too young at heart for my own good. Aww, thank you! Beware liquid beverages–wait, what beverages are you drinking that aren’t liquid? Jello shots ;)? Don’t you dare stop posting dog pics! That’s the only reason I come here… I mean uhhh congrats! Hahah! 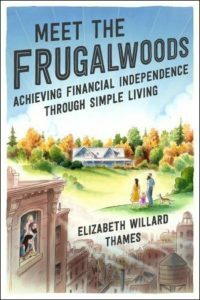 You’ve discovered my secret… Frugalwoods is really just a cover so that I can get away with posting millions of Frugal Hound photos ;). Thanks for the congrats! Congrats on the nomination as well! This will be my 2nd FinCon. Went last minute last year and actually didn’t get my ticket until the day I arrived in STL.